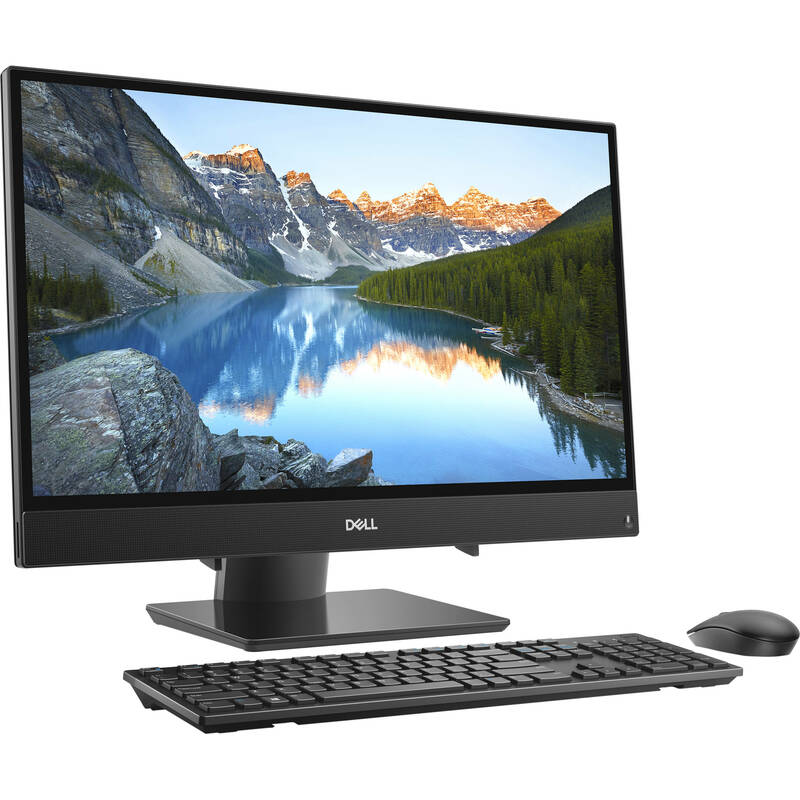 Designed for general use, including watching streaming videos and chatting, the 23.8" Inspiron 3480 Multi-Touch All-in-One Desktop Computer from Dell features a 23.8" IPS anti-glare display with ten-point multi-touch functionality, allowing you to utilize the touch gestures and functions in Windows 10 to further improve accessibility and productivity. Furthermore, driven by the integrated Intel UHD Graphics 620 chipset, the screen has a Full HD 1920 x 1080 resolution that delivers crisp and clear pictures, as well as a refresh rate of 60 Hz, a maximum brightness of 250 cd/m2, a contrast ratio of 700:1, and viewing angles of 85°. An HDMI 1.4 port on the back of the chassis supports audio and video output. This system is powered by a 1.6 GHz Intel Core i5-8265U Quad-Core processor and 8GB of 2666 MHz DDR4 RAM that can be upgraded to 16GB and allows you to efficiently multitask, as well as quickly access frequently used files and programs. For storage, it has a 1TB 5400 rpm SATA 2.5" hard drive, plus an empty PCIe 3.0 x4 slot for an M.2 2230/2280 SSD or Intel Optane Memory. You can connect external storage options, optical drives, memory card readers, printers, keyboards, mice, and more using its three USB 3.1 Gen 1 Type-A ports or one USB 2.0 Type-A port. Additionally, you can take advantage of the SD/SDHC/SDXC card reader to expand your storage as well as transfer data between your mobile devices. Connect to the internet via Wi-Fi 5 (802.11ac) or the Gigabit Ethernet jack for a more stable and reliable wired connection, while additional compatible wireless peripherals can be paired using Bluetooth 5.0. Other integrated features include a 720p webcam, integrated microphones, dual speakers, and a 3.5mm headphone/mic jack. For additional convenience right out of the box, the 23.8" Inspiron 3480 also comes with a keyboard, mouse, 90W power supply, and power cord. The operating system installed in this computer is Windows 10 Home (64-bit). Waves MaxxAudio Pro boosts volume and clarifies tones, so you experience studio-quality sound. Everything from the brightest cartoons to the darkest dramas shine on this 23.8" Full HD display with a narrow-bezel design. The IPS wide viewing angle display means TV shows, movies, and games look great no matter where you sit. The edge-to-edge touchscreen with ten touch points creates an interactive experience. Save space and cut back on hassle with a single piece of technology that contains everything you need—computer, monitor, and speakers—all in one. Just open the box, plug it in, and start exploring. It's that simple. Get more done in less time with an 8th Gen 1.6 GHz Intel Core i5-8265U Quad-Core processor that zips through tasks quickly. 8GB of 2666 MHz DDR4 memory means you can accomplish more in less time. Please note that while 2666 MHz memory is installed, the processor limits the effective memory speed to 2400 MHz. Enjoy reliable internet connection without the need for cables thanks to Wi-Fi 5 (802.11ac) wireless technology. When paired with Bluetooth 5.0 peripherals, this system can deliver improved performance, more wireless range, and higher data transfer rates than Bluetooth 4.2, while also providing enough bandwidth to support two devices. Access multiple devices without dividing your attention. Dell Mobile Connect pairs your iOS or Android smartphone with your system. With Dell Mobile Connect, you get the option to channel notifications from phone calls, SMS, IMs, and other apps right to your display. Keep your focus on a single screen and respond only when it's convenient for you. Your phone connects to your Inspiron 3480 via Dell Mobile Connect's point-to-point secure connection, so your data is never exposed via unsecure internet connections.